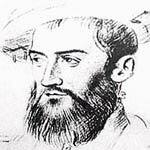 On this date in 1565, the French Huguenot New World settlement plan was nipped in the bud when Spaniards executed en masse the inhabitants of Fort Caroline in present-day Jacksonville, Fla.
Jean Ribault (or Ribaut) was the loyal naval aide chosen to lead this colony. After an abortive attempt to plant a settlement in Charlestown, S.C., Ribault set up Fort Caroline and claimed greater Jacksonville for France. 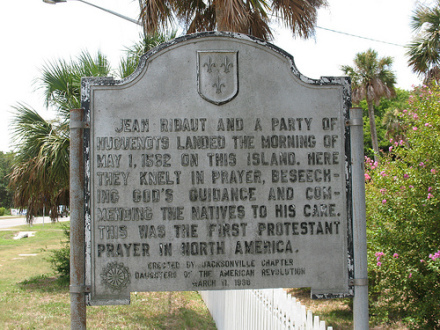 Historical marker of Jean Ribaut/Ribault’s landing place, in Jacksonville, Fla. (cc) image from POsrUs. French colonial projects further north enjoyed better success. Down in Florida, both geopolitical and religious rivalry set Fort Caroline up for trouble. Ponce de Leon, questing for the Fountain of Youth, had planted the Spanish flag in Florida half a century before, and that country was none too pleased to find its continental rival jumping its claim. That it was Calvinist Frenchmen doing the usurping would prove downright intolerable to more-Catholic-than-the-Pope Spanish ruler Philip II. That great Protestant state, of course, eventually gobbled up Florida, and still owns it today. * It’s another country, another creed, and another century, but it reminds of the traffic between English New World settlements and England proper during the English Revolution. ** A different historical monument commemorates the failed South Carolina colony. My grandfather and his father were Huguenots who settled in South Dakota. My grandfather was Clarence Calvin DuBois and his father was Methuselah. Wky and when did he Huguenots move to S. Dakota? Was there a larger settlement there? How can I find out where my great grandfather’s family was from in France? My son is going to France soon and would like to visit the town if possible.